This page has been marked as a work in progress. The information on this page is incomplete and should not be relied upon as accurate or official. Please check back later. Describe your character's life before they became aware of The Secret World. Remember, this is just a suggestion! You can change the titles of these sections to anything you want. How did your character become part of the Secret World, and what have they been up to since then? Rovena transitioned without changes from TSW to SWL. Her access to Tokyo had been revoked in the last plot of the Phoenix group anyways and it just happened to be that she regained it now with the reopening of the Tokyo portal. 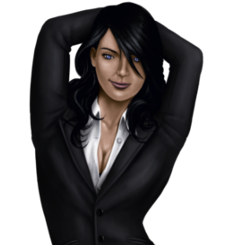 While Rovena remains unchanged and everything that happened with her still remain canon, a few adjustments had to be made for other players changing their characters. Also all open plot lines that have not seen any interaction in a while have been closed and removed from her history. That said, the vast majority of her history in TSW will fade into the role of background stories. Something that formed her, got her where she is and leaves a few hooks for people involved back then, but most of it will not be brought up again unless specifically interacting with someone involved back then. Everyone knows someone. What groups, people, friends, and relatives does your character have ties to? Would other characters know them from a favorite hangout or a particular organization? Are they demon-possessed? A skilled Elementalist? Want to describe their awesome powers or trademark equipment they always carry? This is the place to do it. If you want to add more sections, just copy this block and change the title/text to whatever you want! But please don't edit below this line!